Del Mar's 2018 fall racing festival had several standout performances, including a smart victory in the Grade I Hollywood Derby by Peter Brant's Raging Bull on closing Saturday, then an equally impressive triumph by Uni – owned by Michael Dubb, Robert LaPenta, Head of Plains partners and Bethlehem Stable – the next day in the Grade I Matriarch. Both of those Eastern-based horses are trained by the country's top conditioner, Chad Brown, and both were ridden by former three-time Del Mar riding champion Joel Rosario. 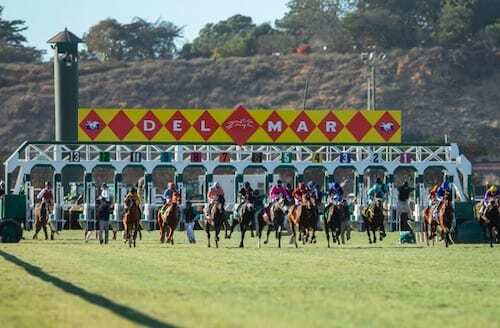 This entry was posted in The Biz and tagged Chad Brown, Del Mar, del mar fall meet, del mar thoroughbred club, drayden van dyke, joe harper, joel rosario, Peter Miller, raging bull, uni by Del Mar Thoroughbred Club. Bookmark the permalink.